This display celebrates the wooded landscape of Suffolk and East Anglia and how artists have responded to this aesthetically dominant yet magical covering of the landscape. Images are a small selection of work on display. 'My compositions from fallen and forgotten timber are studies in the narrative beauty of wood'. He later lived in Norfolk and was acclaimed a child prodigy after his work was seen by Laura Knight. He became a commercial artist but by 1964 he was able to become a full time artist through the patronage of the Duke of Bedford and support of Kenneth Clark. His visionary art continued a tradition from Samuel Palmer but was infused with an air of surrealism. His work features in the V&A and the Yale Center of British Art in the USA. John Northcote Nash (1993-1977) was the younger brother of Paul Nash. He had no formal art training and was encouraged to develop his work by his brother. He was an Official Artist in both world wars and specialised in landscape painting from the 1920s. He regularly visited East Anglia from the 1930s and eventually moved to Wormingford in 1946. Paths in the Woodland, c.1950s. On taking up landscape painting after World War One, Nash often combined his love of botany with his art by painting trees and woodland. 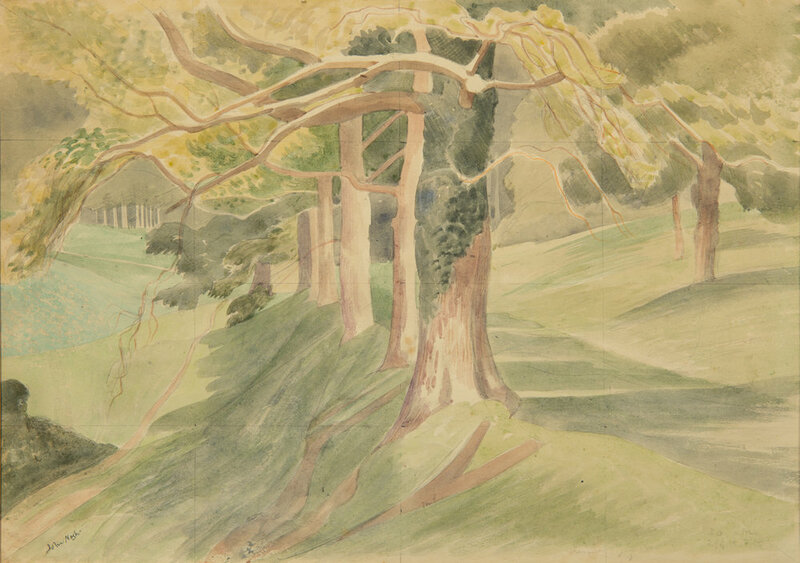 His watercolours were especially celebrated in capturing something quintessentially British in landscape and this jewel-like study demonstrates his skill with its vivid sense of depth and woodland light and colour. Details of subjects, colours and sizes inscribed in pencil with triangulation lines throughout the composition are suggestive that this is study although it is highly worked up and signed. This painting was exhibited at The Fine Art Society in 1969 and was purchased by a collector in New England, U.S.A.
Collage Maquette for the Harlow Mural, BHS c.1980. Joyce Pallot (1912-2004) met fellow artist and designer Henry Collins (1910-2004) at the Colchester Art School in 1932 and the couple subsequently married in 1938. Pallot studied industrial design at Southend-on-Sea whilst Collins studied at the Central School in London. They formed a dynamic partnership from 1948 designing murals and exhibitions, including the Sea & Ships Pavilion at the Festival of Britain and then later producing many large scale murals in new shopping centres across the UK.This is a rare collage maquette for the Collins’ Harlow Mural which was installed by British Home Stores. Their murals in Colchester were awarded Heritage Lottery Funding in April 2017. Newcomb (1922-2008) was an instinctive and visionary artist who explored and captured the rhythms of nature and rural rituals - often captured the 'mark making' and patterns created by man.